Japanese Tea Story : Gyokuro + Tencha = !??? Gyokuro + Tencha = !??? G7 summit was held in Ise-Shima in Japan last month. At its working lunch, Japanese tea called “Gyokuten” was served. What is “Gyokuten”?? I’ve never heard of it. According to my reserch, “Gyoku” is for Gyokuro. "Ten” is for “Tencha”, which is the name for tea leaves used for Matcha. 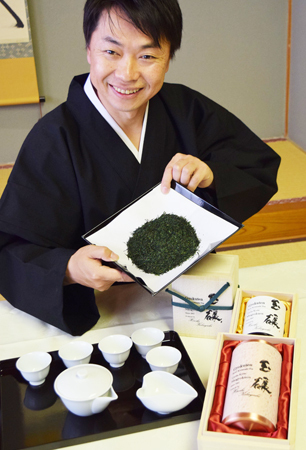 Once the leaves called Tencha are ground into fine powder, the powder tea is called Matcha. In other word, ground Tencha is Matcha. Anyway, "Gyokuten" is a blend green tea from Gyokuro and Tencha. I know I see many tea blended with Matcha like “Sencha with Matcha” and “Matcha Genmaicha”. So I guess people are not surprised anymore by tea blended with Matcha. Instead of Matcha, which is everywhere now, it may be the time for “unground Matcha” =Tencha now. "Water brewed" and "Ice-cube brewed"